Trends don’t start and stop with the calendar, so naturally, a number of today’s top trends will slide smoothly (and hotter than ever) into the upcoming year. A few prominent examples? Going where no event has gone before instantly perks interest. You can repurpose almost any space — from a sports complex concourse to a museum — into an event venue without losing its innate ambiance. Go wild with a pop-up venue. Or head outdoors. Or up to the roof. Or get out of the city and into a serene rural setting. Going local in every way is a major trend for large and small events. You can get the full flavor of whatever host city you choose, from off-site activities to local (but relevant) speakers to meals prepared with local ingredients. “Go local” within your event by offering signature bar drinks or — the ultimate in personalization — DIY food or beverage stations instead of the usual buffet or plated meals or bar. Stock up on tasty options (including ones that cater to vegetarians, vegans, etc.) and let folks go to it. Rarely do people attend an event because of the food, but how you handle food and beverage can transform your event into a memorable experience. The only way to create a comprehensive, memorable experience for people is to connect with them emotionally and psychologically. Think intriguing aromas, music or tweeting birds that draw attendees from one area to another: interesting textures and interactive screens that invite folks to touch; unusual meal ingredients, vendor sampling, wine or micro-beer tastings that add flavor to the event. So, what else is on the horizon in the “wow!” department? Chatbots, text or voice, free up staff time by answering questions, offering up event reminders or updates, conducting surveys, etc. What fun! Who knew Siri and Alexa would be attending? Facial recognition is coming into its own. Still expensive, but so cool (and more secure) for registration, and a snazzy way to enable tagging for social media posts. Including remote audiences extends your event’s reach and benefits. Live streaming and 360-degree video not only delivers content, but can also link virtual and in-person attendees digitally to facilitate everyone’s participation. Great for group discussions and networking. With all this cool, new technology comes the need for security. Not the sexiest trend, but important, attendees want to know you have their back when it comes to protecting their personal safety, their data and devices. Presentations that capture and hold attention are interactive experiences that include live Q&A, hands-on learning, facilitated small group discussions, even content gamification. 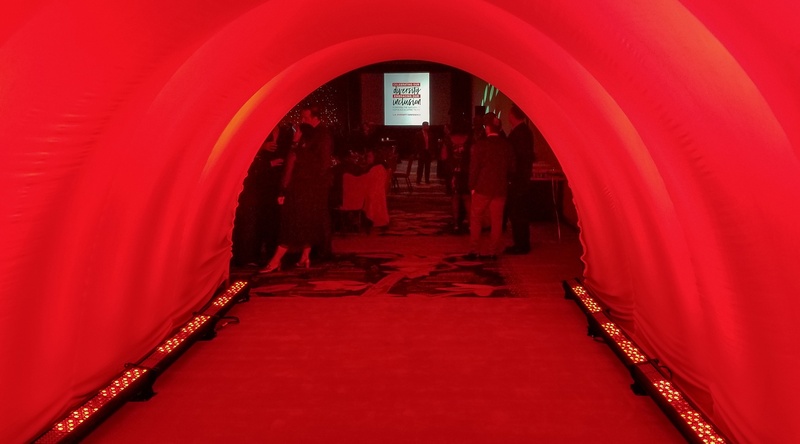 Surroundings are immersive, with projection mapping, balloon tunnels, whatever it takes to set the tone from the first step in the door through closing remarks. Instead of tons of tiny decorations, go bold with just a few larger-than-life statement pieces. With social sharing a top goal of every event now and in 2019, think “photo op” at every turn. A great venue is good, but an interesting location will draw more attendees. Combining a day or few of leisure with business trips is very hot now, so pick a location with lots to see and do (or kickback) before or after your event. Can you schedule around a local happening or a weekend? Promote the "bleisure" opportunities along with your event agenda. Large events can feel overwhelming and hinder connection, so intimate or exclusive spaces will be big in 2019: rooms set aside for quiet time or pampering; invitation-only small groups activities; roped-off VIP areas; niche networking lounges. Large-scale events that wow in 2019 will be scaled for people and high on relevant tech, situated in interesting venues, and designed to stimulate the imagination. With all that, no one will want to miss out.